If there is one place on earth that can boast of social and political confusion, it is certainly Russia. Consider this recent drama, set in the Arctic Ocean, which included the following cast of characters: seafaring pirates, a multi-billion dollar oil corporation, KGB-type special guards (working undercover), and Putin & Co. 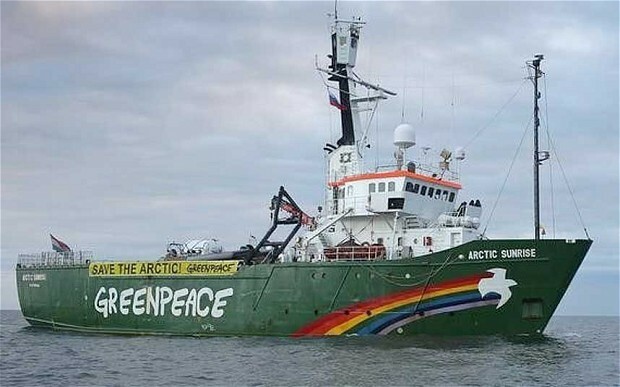 In September, a Greenpeace ship, Arctic Sunrise, had ventured into the Pechora Sea to protest Gazprom’s oil drilling practices in the Arctic. While navigating under a Dutch flag in international waters, the Arctic Sunrise had been stormed, boarded, and inspected by the Russian authorities. The Greenpeace activists were subsequently charged with a number crimes by the Russian government, including piracy and “hooliganism.” Although these charges were eventually dropped, the activists did spent time confined in a Russian jail. The storming of Arctic Sunrise while it navigated in international waters and under the Dutch flag was a clear violation of human rights and international law. Yet, the Russian Foreign Ministry refused to take part in arbitration held under the International Tribunal for the Law of the Sea. However, as a signatory to the 1982 United Nations Convention on the Law of the Sea, Russia would have to comply with the International Tribunal’s decision. Russia’s allegations of piracy were ludicrous. On the other hand, based on Russia’s own penal code (it has one), there is a good argument that the Russian coast guard had engaged in an act of piracy by boarding the Adriatic Sunrise, threatening violence, and aiming to seize the property of the Greenpeace ship. However, Russia can say this for itself: it sent a clear message that any interference with its Gazprom oil rigs will not be treated lightly. « Can a Chimpanzee Achieve Legal Personhood? Russia definitely send a clear message. The people were not treated lightly. It would not be surprising if the Arctic Sunrise incident continues to impact Russo-Dutch relations, as these relations had already been strained by several unfortunate incidents. For now, we can only join Greenpeace in applauding Dutch government for standing by the activists’ freedom to protest peacefully. Today, Netherlands is uniquely poised to impact the maritime law in relation to free Arctic’s sustainable future.